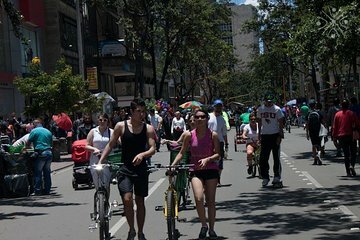 Esplora le principali attrazioni storiche di Bogotá e i quartieri più interessanti su due ruote durante questo tour in bici di 5 ore. Scopri le principali zone della città, tra cui Plaza de San Diego e La Candelaria, quindi vai a Plaza de Bolívar (Plaza Bolívar) dove potrai vedere il Capitolio Nacional (Campidoglio Nazionale) e La Catedral Primera (Cattedrale Primaria). Questa avventura in bicicletta comprende anche il noleggio di biciclette, la guida e il trasporto di andata e ritorno dal tuo hotel. I applied to this tour with a transportation service. The guide, owner of the bike shop, and driver were all friendly and kind. The condition of the bike was pretty good. With some exceptions, most parts of the route were flat so I could also enjoy the ride. There seem heavy traffic jams in Bogota in business days, so if your are a busy visitor, this tour would be both time- and cost-efficient. Excelente Tour, el personal súper amable, nuestro guía Nick nos dio un excelente recorrido, dándonos detalles adicionales de los puntos que visitamos ademas de ser muy atento, nos dieron a probar cosas típicas de Bogotá, un recorrido altamente recomendable, en definitiva una gran experiencia. I would not recommend this tour even to my worst enemy. The tour took us through one of the most dangerous areas of Bogota. Calle 26 y Caracas where our guide made us take shelter from the rain in the street. While we were waiting for the rain to stop we were robed at gun point of our cellulars and bicycles. The response to the incident was completely disorganised . The tour guide did not contact the police and continued to expose the group to danger making us take a taxi in the middle of the most dangerous area. The owners have not contact me to offer any kind of help and people in my hotel are all very worried about this incident being a setup. Under no circumstances take this tour with this agency. I am glad a survived this awful incident I praise God and wish this doesn't happen to anyone else. The bike tour was wonderful. My mistake was booking online. Next time I will book in person or directly through the tour people. I paid 85 when others paid 14 because they booked the tour in person. The tour gave me the opportunity to see all sorts of things around the downtown area of the city. I then took that information and expanded my tour the next day alone. Fantastic tour... get to see a side to Bogota which few probably do. The graffiti murals were awesome and Alejandro was a fantastic guide. Small tour group made it far more personal and personable. Definitely worth the time and the money. This tour was fantastic!!! Thanks to Fernando, our guide, we discovered a completely new Bogota! We had such a wonderful day and really learned a lot about the city! I even left a recommendation at our hotel for other visitors. The tour is 6 hours long, BUT there are lots of breaks and the majority is pretty flat. The bikes were in great condition! When one of the bikes got a flat tire, a secondary guide rode it back to the shop to get another one. Please take this tour . . . it will help you appreciate Bogota and the determination of its people. Wonderful tour with 'Bogatours'. Our guide was Edgar, who was terribly knowledgeable and we learnt a huge amount about the history and life of Bogotá. We were shown emerald traders, exotic fruit, the old bull ring and many other 'sights'. So much better than any guide book!